the U.S. Constitution. We recognize that Catholic tradition originates in the words and behaviors of Jesus. nundra, and incite the need for new epistemic frameworks to address the complexity of female sexuality. nities, their communities protect their equality and their needs. persede fairness a nd retrib u tion in our society. 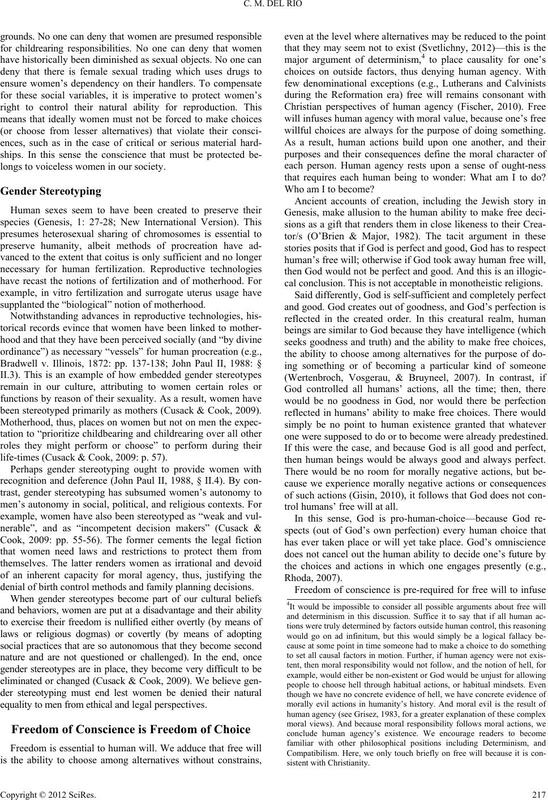 traceptives, abortifacients, and sterilization (AHCRL, 2012). gists, psychiatrists, physicians, and so on. that inform the current discourse on reproductive matters. autonomy, and loyalty provide impetus to our discussion. epistemic perspective have opened the door for this discussion. clarity as we draw language from each of these disciplines. (from Latin artefactum, human made), but human persons. may be unwanted, mistimed, or unplanned. 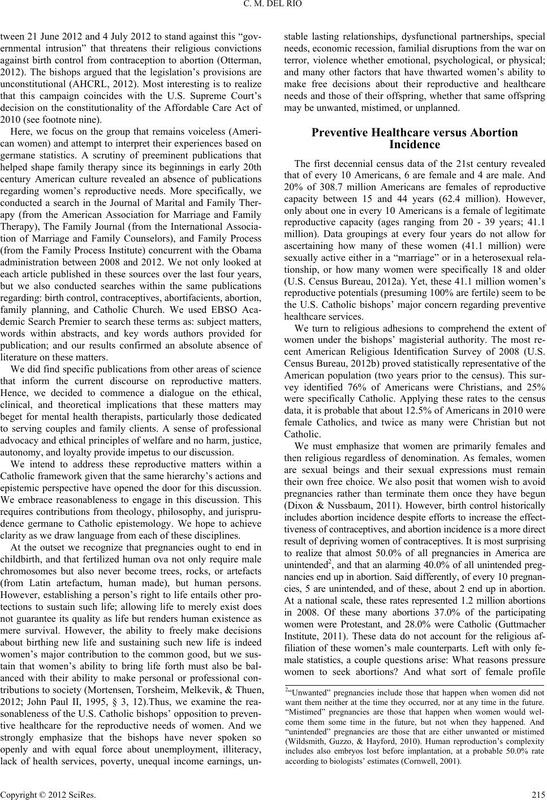 cent American Religious Identification Survey of 2008 (U.S.
cies, 5 are unintended, and of these, about 2 end up in abortion. want them neither at the time they occurred, nor at any time in the future. according to biologists’ estimates (Cornwell, 2 0 0 1 ) . no commentary. Instead we only report them for reflection. engage in contraceptive practices, and, at times, in abortion. poverty, and women whose education is limited (Dudley, 2003). added to their religious sense of sexual guilt (Yip, 2010). females, and males with perceptible congenital malformations. in obstetrics became prominent in England and in the U.S.
enter into material hardship have more children in their homes. patriarchy has remained embedded into the cultural fabric of societies. through the centuries unto contemporary social groups across cultures. which motherhood is conflated with womanhood (Cuzack & Cook, 2009). longs to voiceless women in our society. supplanted the “biological” notion of motherhood. been stereotyped primarily as mothers (Cusack & Cook, 2009). life-times (Cusack & Cook, 2009: p. 57). 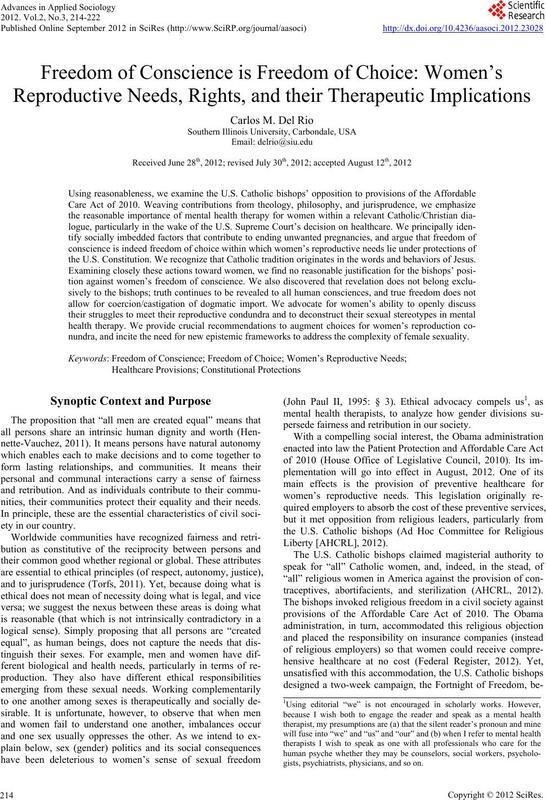 denial of birth control methods and family planning decisions. equality to men from ethical and legal perspectives. willful choices are always for the purpose of doing something. that requires each human being to wonder: What am I to do? cal conclusion. This is not acceptable in monotheistic religions. one were supposed to do or to become were already predestined. then human beings would be always good and always perfect. trol humans’ free will at all. explicit acti ons must also carry the same free nature. manifest may be indeed perceived as ontological realities. judges must be appointed to the Supreme Court (Potts, 1967)5.
dom. Herein lays the challenge of religious liberty: The U.S.
ulterior motive of instilling their magisterial authority in sexual matters. alluded to threats to freedom ex cathedra. Second, the president of the U.S.
ing freedom of conscience, w hi ch imbues freedom of choice. perspectives may provide diverse answers to these questions. However, mental health therapists must address these questions. wives, mothers, sisters, daughters, citizens, and persons? message both in academia and in the therapeutic encounter. erate the sacramental grace that Jesus freely intended for all human beings. trast, history h as evinced that papal positions have contradicted one another. that the church’s teaching authority is not always infallible (Pham, 2004). albeit it successfully contributed to the extermination of Semitic people. nesses in licit proceedings (Daniel-Rops, 1962; Ketzer, 1978). today ought to learn from Jesus’ selection of women over men. Certainly Jesus never addressed women’s sexuality directly. to serve ham sandwiches.” This argument obviates the U.S.
and condemnation of women due to their sexualities. given that the U.S. Catholic bishops commenced this dialogue. ered that he exalted women against the traditions of his time. signs comprised his ministry, his redemption, and his legacy. motherhood, leaving out the men who share their sexuality. “flawed” has tremendous theological and scientific implications. also requires reflection and constant prayer (Girzone, 2006). nimous presence to earth (Luke 18: 9-14). needs under any healthcare provisions. learn from Jesus’ words and actions (Paul VI, 1965a: § I.2). dom to choose outside the scope of civil and constitutional law. licit regarding their sexualities and their reproductive choices. hardships in our society (Meehan, 2011). theology to jurisprudence and to therapeutic theory and practice. We close with a simple parable (on 24 June, 2012). and so on). They were arguing about their sense of freedom. work (Briefing Paper). Washington, DC: Economic Policy Institute. Bradwell, V. (1872) Illinois. 83 U. S. 130, 137-138 . Bujalkova, M. (2007). Debate and education: Birth control in antiquity. Bratisl Lek Listy, 108, 163-166. Charles, V. E., Polis, C. B., Sridharab, S. K., & Blum, R. W. (2008). view of the evidence. Contraception, 78, 436-450. 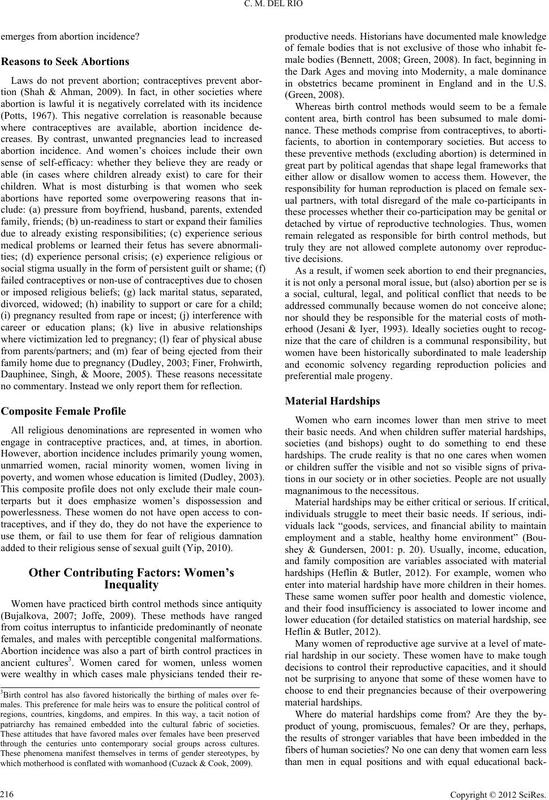 Isolating the effects of abortion in the national comorbidity survey. 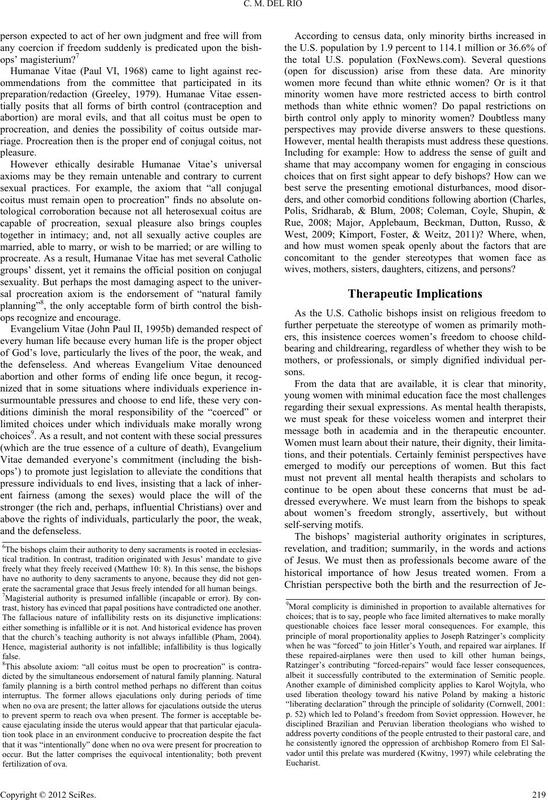 Journal of Psychiatric Research, 43, 770-776.
of Catholicism. New York: Penguin Putnam, Inc.
Rights & Social Justice, 16, 47-78.
customs of its people. New York: Hawthorn Books Inc.
number 345. The Law School, The University of Chicago. constitution. Massachusetts: Harv a rd University Press. 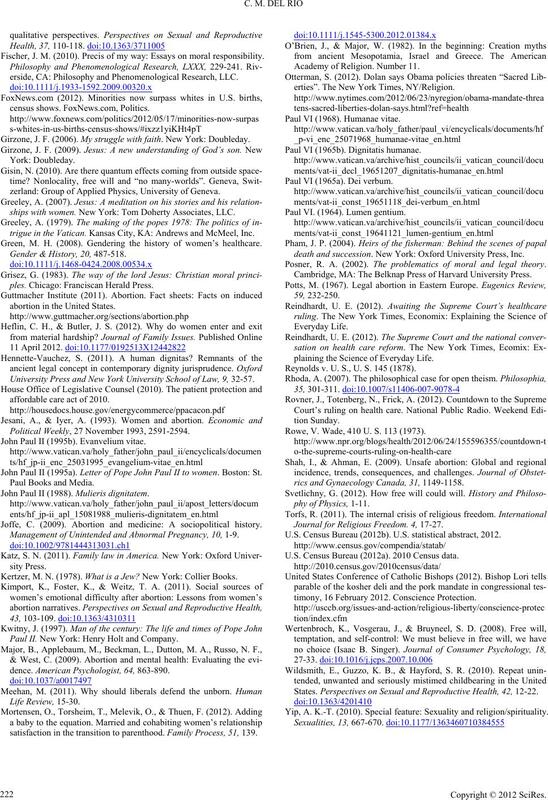 Finer, L. B., Frohwirth, L. F., Dauphinee, L. A., Singh, S., & Moore, A.
Fischer, J. M. (2010). Precis of my way: Essays on moral responsibility. erside, CA: Philosophy and Phenomenological R es e a rch, LLC. census shows. FoxNews.com, Po litics. zerland: Group of Applied Physics, University of Geneva. ships with women. New York: Tom Doherty Associates, LLC. trigue in the Vatican. Kansas City, KA: Andrews and McM eel, Inc.
Green, M. H. (2008). Gendering the history of women’s healthcare. Gender & History, 20, 487-518.
ples. Chicago: Franciscan Her ald Press. University Press and New York University School of Law, 9, 32-57. Political Weekly, 27 November 1993, 2591-2594. John Paul II (1995b). Evanvelium vitae. John Paul II (1995a). Letter of Pope John Paul II to women. Boston: St.
John Paul II (1988). Muli eris d ignit atem. Joffe, C. (2009). Abortion and medicine: A sociopolitical history. Management of Unintended and Abnormal Pregnan cy , 10, 1-9. Paul II. New York: Henry Holt and Company. dence. American Psychologist, 64, 863-890.
satisfaction in the transition to parenthood. Family Process, 51, 139. Academy of Religion. Number 11.
erties”. The New York Times, NY/Religion. Paul VI (1968). Humanae vitae. Paul VI (1965b). Dignit a t is humanae. Paul VI (1965a). Dei verbum. Paul VI. (1964). Lumen gentium. death and succession. New York: Oxford University Press, Inc.
Posner, R. A. (2002). The problematics of moral and legal theory. Cambridge, MA: The Belknap Press of Harvar d University Press. plaining the Science of E veryday Life. Reynolds v. U. S., U. S. 14 5 (1878). Rowe, V. Wade, 410 U. S. 113 (1973). rics and Gynaecology Canada, 31, 1149-1158. 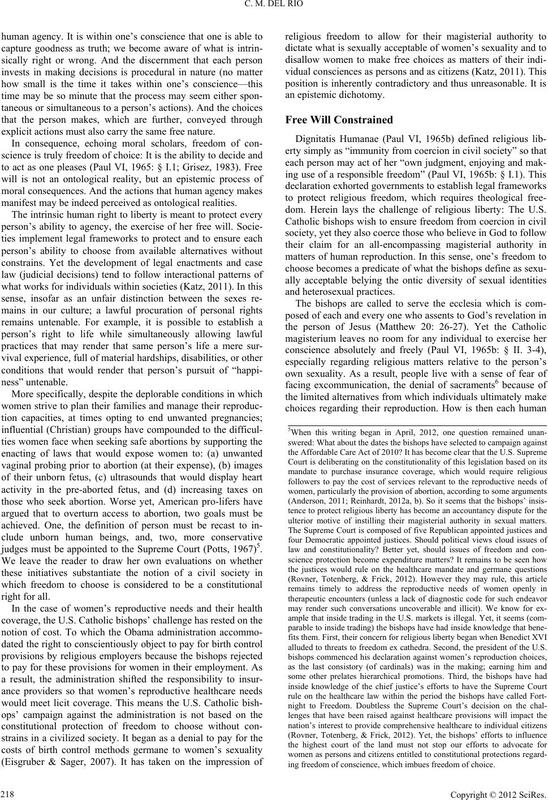 Journal for Religious Freedom. 4, 17-27. U.S. Census Bureau (2012b). U.S. statistical abstract, 2012. U.S. Census Bureau (201 2 a ). 2010 Census d at a .
timony, 16 F e bruary 2012. Conscience P rotection. States. 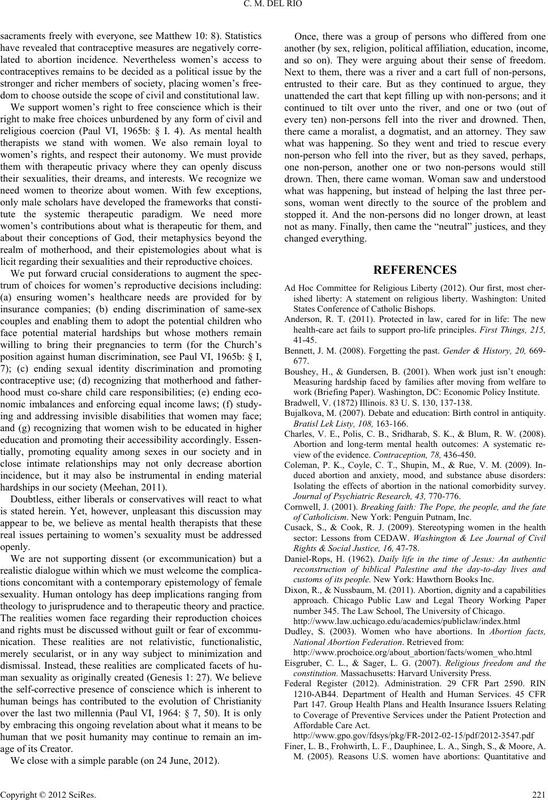 Perspectives on Sexual and Reproductive Health, 42, 12-22. Yip, A. K.-T. (2010). Special feature: Sexuality and religion/spirituality.